Another McDonald's advertisement is stirring up controversy, though this one is limited to New York City. A rider noticed the following advertisement while riding to work one day. The quality of the image is poor and the corner appears to obstruct some of the ad, but the message is still clear. A McDonald's representative said the offensive ad was being pulled from the train immediately and apologized to anyone who was offended by it. Sanders said Ronald McDonald (the mascot of McDonalds) was no longer welcome in Rockaway. Is the councilman overreacting or is his anger justified? If Rockaway is the end of that particular train line, I don't see it as any kind of slight at all. 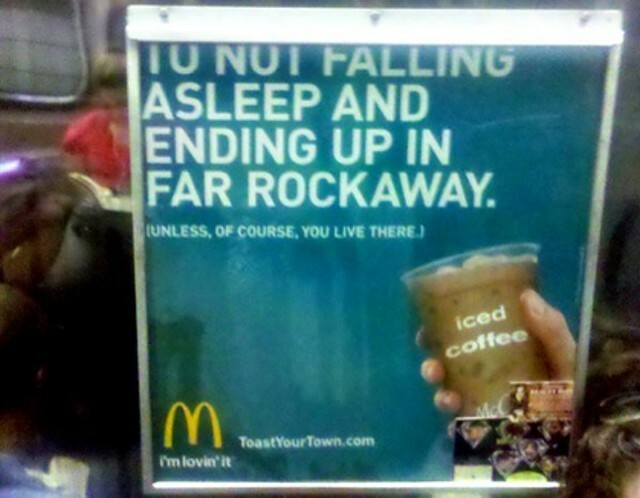 It's saying if you need to stay awake and not miss your stop, you should pick up an iced coffee from McDonald's. People are so easily offended... sheesh. To be completely honest i know a TON of people, myself included, that have passed out on the train and woke up in Far Rockaway. I think this ad is genious for those of us who have experienced that annoyance. Laurie, I could not agree with you more. People are so quick to freak out. Apparently the Rockaway residents snub their noses at visitors. I agree with Erik and Laurie. Good thinking on the advertisors part! Leave the ad be. Somebody needs to take a stand once in a while. Those who don't like it can ignore it.